As a kid I, like many folks at the time, liked cars with jet-like fins. Plus I’ve always been a sucker for the cool fake spare tire molded into the trunk lid. 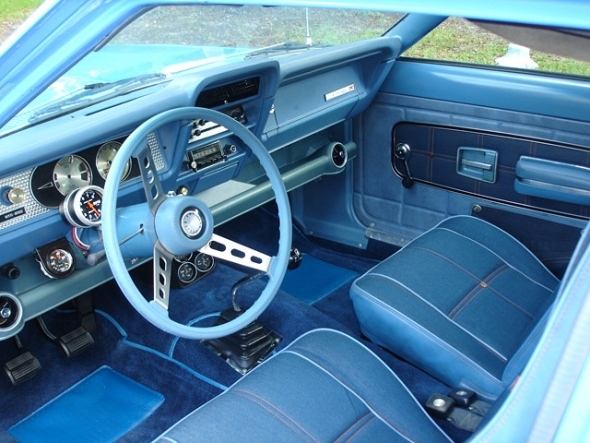 So Imperials, Chrysler’s luxury brand, were, and are, a favorite. Few Imperials were more impressive than the 1957 Crown Southampton, a monster of a car, but dripping with style. Its nose with twin dual headlights favored Cadillac styling, but its slightly outward leaning tail fins and aircraft-like pointed taillights set it apart from the more staid luxury models of the day. BoS-Models now creates a beautiful 1957 Southampton in a stunning bronze paint scheme with a cream-colored roof and enough chrome to blind an army of car show onlookers on a sunny day. This is in 1/18 scale and the body is cast resin. 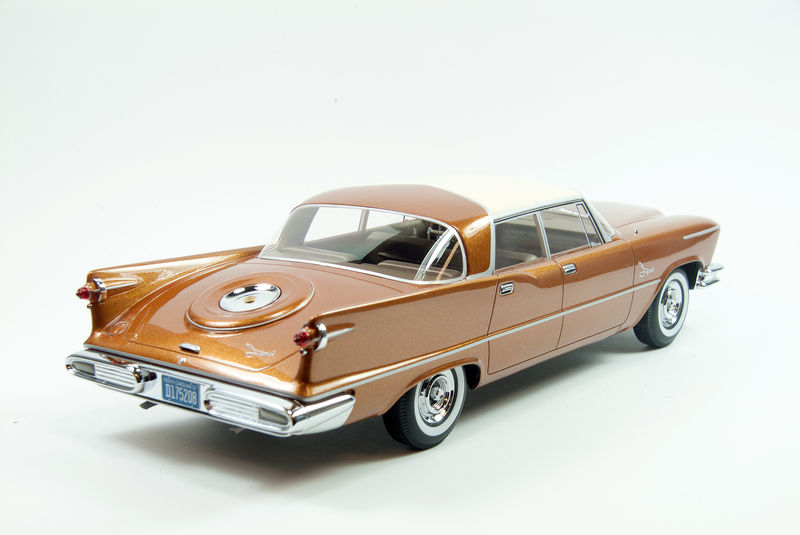 Imperial became its own brand, like Cadillac for GM and Lincoln for Ford, in 1955. 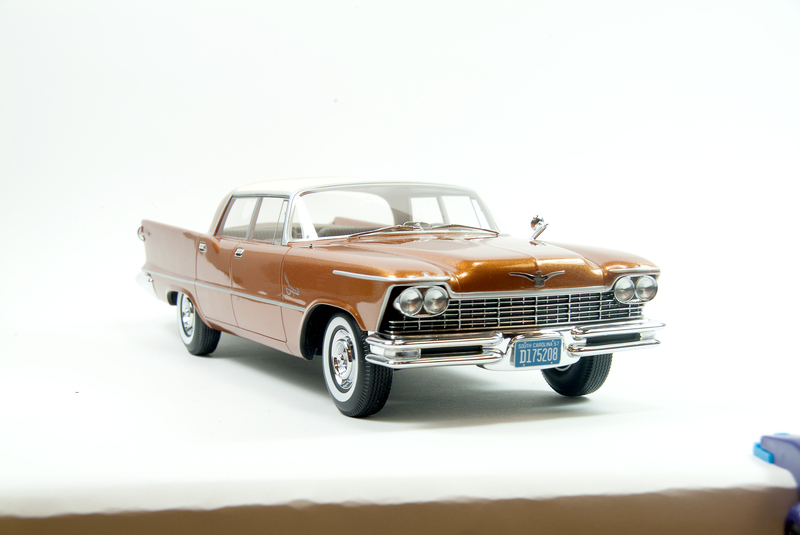 The second generation Imperials debuted in 1957 and had their own distinct platforms, something that lasted until 1966. These brutes were big and strong, so sturdy in fact that they were banned from most demolition derbies as being too tough to knock out of competition. Much of the reason was the Imperial’s full perimeter frame with box cross sections forming an “X” for strength. Meanwhile most cars were moving to lighter unibody construction. Oh, I had one of those……. Bet I could count on one hand the amount of guys who never played with model cars growing up. We had them because there was a connection. Our parents, relative, or the guy down the street had one. Yup, he was the cool guy. We smashed them, burned them, and blew them up. Boy did I get busted for that one. Of course we did have special ones that never went out of our bed rooms like your first one. Remember it? I remember mine and it wasn’t a Rambler. I was probably about five or six. Dad and I had an HO train layout so we made several trips to the local hobby shop growing up in Madison, WI. to get more stuff. There it was, the shiny bright object before I even knew about shiny bright objects! 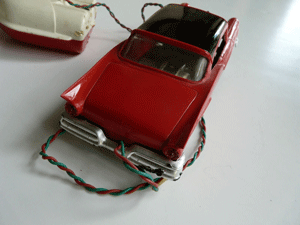 It was a promo model car and dad knew I wanted it but I would have to do one thing first. OK, I’m giving a deep dark secret here. Like Linus, from Peanuts, I had this blanket that, well I sucked on. Hey I was a kid. So I gave it up. Yup, I wanted it that bad. Now you’re wondering what was the car? You would never guess in a million years! 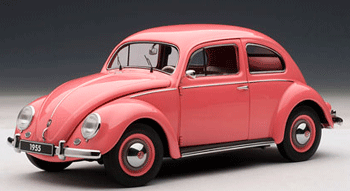 Wait for it…..an early 60’s Volkswagen Beetle, and it was pink. An early view of my softer side:) As I picked up on how this whole deal worked, I was giving up all kinds of promo models for doing stuff my parents wanted me to do and I made them think it was their idea. Just the other day I was “just looking” on eBay and came across another early car I had that let me run it around with a remote control. This 1958 Ford Hardtop made by AMT was exactly like it. 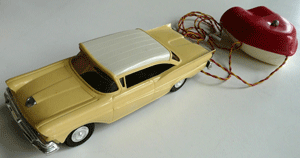 Took two D batteries and you could run it forward and backwards and turn it left and right. Hey this was the technology of the day. One of my relatives must have given it to me as a gift at one time, this one went for 140 bucks recently on eBay while this red 57′ sold for 99 bucks. But I also had one even cooler than that, a 1958 Skyliner that retracted the top just like the real one back into the decklid. Couldn’t find one but it was exactly the color of the real deal here only nowhere near as complicated. 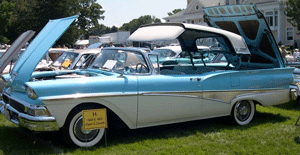 The Skyliner was the only true hardtop convertible in the world when it was introduced in 1957. The top came down with a touch of a button but that was the simple part. To get the top into the deckle took three roof drive motors driving four lift jacks, four door-lock motors, ten solenoids, and four locking mechanisms for the roof. 610 feet of wiring made sure all that stuff was talking to each other. A good example is hard to find and when one is it will take about $75,000 to take it home. Too rich for me. I’m going to keep looking for the model I once had. Give me a shout if you find one. Ford’s midsize sedan, Fusion, has been well received both because of its high-end somewhat sporty looks and its driving characteristics. Fusion may prove to be Ford’s biggest hit since the Taurus was new. Fusion melds, or should we say, fuses the looks of an Aston Martin or Jaguar’s upscale sporty nose with the tail and profile of a sleek Mazda6 to create a good-looking family sedan that can make any suburbanite proud of his or her nod to trendy car fashions. Gone is the look-alike (nose at least) mid-size sedan. Add in that Ford has gone all in on hybrids, including this hot “sunset” (metallic deep orange) Fusion Energi SE, and you’ve got a trendy family hauler. It’s economical to drive, if not to buy. 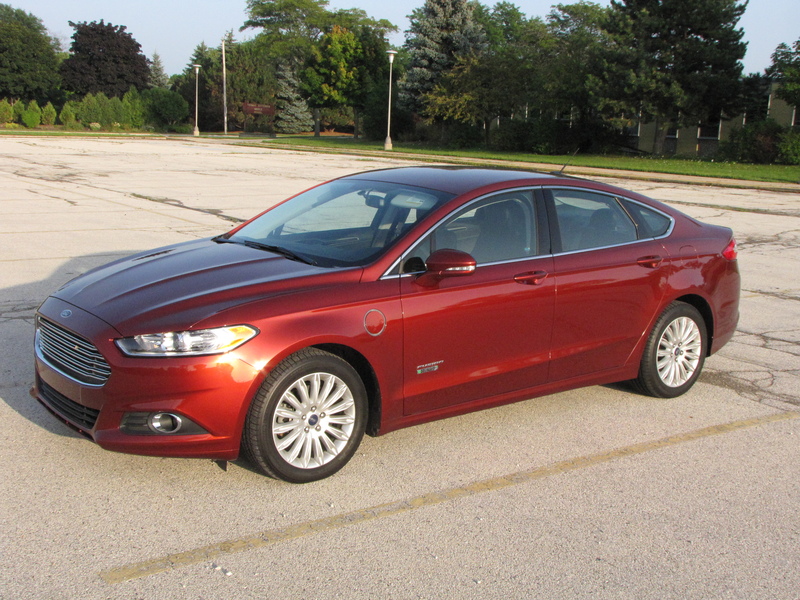 While a gasoline-only powered Fusion can be had in the mid-$20,000 price range, the Energi, a plug-in hybrid, starts at $35 grand and change. The tested SE lists at $38,700. Add in a $795 delivery charge and just two options and the test car hit $40,585. I’ll make this point just once. You don’t buy a hybrid to save money, but to help the environment. Sure, you’ll save each week on fillups. I got 45.2 mpg and shelled out just a bit more than $20 for 300+ miles of driving in a week. EPA estimates put the car at 43 mpg in all gasoline-powered mode and 88 when combining gas and electric, with a full plug-in charge at night. I didn’t plug in each night, but got about 20 miles of electrical charge for each plug in and registered 111 mpg in a day with the charge and driving about 10 miles beyond it. While the car is charged it shows you getting 999.9 mpg. Cool, while it lasts! …and guys should never be seen driving in. Picture a blue open wheel racer with Elf sponsorship and you likely think of Jackie Stewart in a Tyrrell F1 car circa the early 1970s. 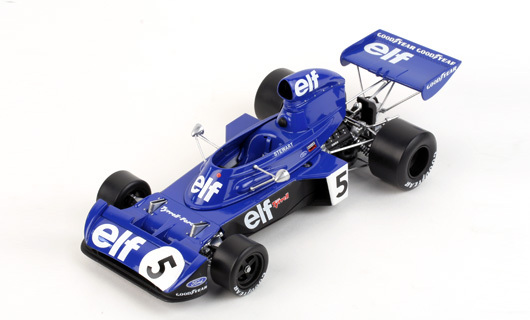 No wonder then that TSM Models created that car, the Tyrrell 006 in 1:18 scale to tempt Formula 1 and open wheel racing fans. This was the car that Stewart wheeled to his third and final F1 World Championship in 1973. Stewart won 6 F1 races in his final season and 27 overall, a record at the time he retired to become a TV commentator, author and business spokesperson. Everyone knows Jackie Stewart and race fans of a certain age loved the look of the 1970s F1 racers, back when ground effects were new and took varying shapes. Here the front and rear wings are large, but look planned. In the late 1960s and early ‘70s the wings often looked odd or like they were thrown on just before the race to see IF they would help. The giant air scoop right behind the driver’s head also gives the Tyrrell 006 a unique, futuristic look. BMWs are racers at heart and BMW’s M Series are the hopped up versions of already racy coupes and sedans that the Bavarian automaker squeezes out of its German factories. Naturally, Germans love to put their BMWs, Audis, Mercedes and Volkswagens to the test on the racetrack. So in the 1980s they began testing their home-country metal on road courses as part of the Deutsche Touring Masters Championship, popularly known as DTM. Think of it as German NASCAR. Back in the late 1980s and early ‘90s BMW’s awesome M3 (first built in 1986) dominated the DTM series. The M3 was the souped up small coupe that sold well as the 3 Series in the U.S. market and was known as the E30 overseas. BMW sold hundreds of thousands of these, the original rear-drive 3 Series being made from 1982 to 1992. 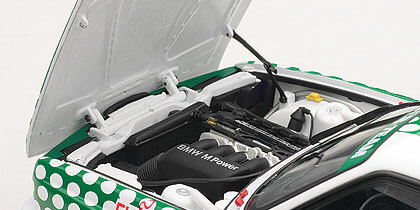 That’s the timeframe Autoart focuses on with a variety of 1:18 diecast models, including the review car, a colorful green, white and gold Tic Tac-sponsored 1991 racer from Tauber Motorsports. That year the car was driven in many of the DTM’s 12-race season by Canadian Allen Berg, who had a varied racing career, including one year piloting a Formula 1 car.